STOCKTON, Calif. - For the third time as an Oakland A's affiliate and the first time since 2010, the Stockton Ports have win the second half title in the California League's North Division. Stockton hung on for a 3-2 win over the Bakersfield Blaze on Tuesday night at Banner Island Ballpark, and with the victory Stockton secured the second half title and home field advantage in the best-of-three mini-series that will be played versus the Wild Card winner next Wednesday-Friday. Stockton opened the scoring in the bottom of the first. Daniel Robertson led off with a single and Chad PInder followed with a double that put runners at second and third. Matt Olson came up and grounded out to first to drive in the first run of the game and give the Ports a 1-0 lead. 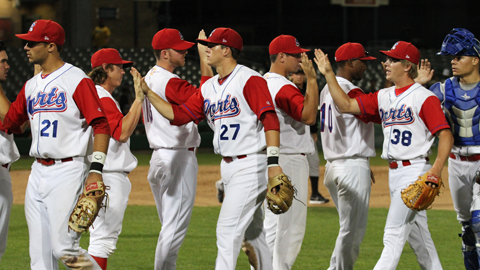 The Ports increased the advantage to 3-0 in the second. Ryon Healy led off with a single and Jaycob Brugman followed with an RBI double to right. Brugman scored two batters later on an RBI groundout by Bobby Crocker. Blaze starter Mike Dennhardt (7-8) suffered the loss after allowing three runs on five hits while striking out seven in five innings of work. Ports starter Jonathan Joseph, making his second straight spot-start, gave up his only run in the third and it was unearned. Beau Amaral led off with a single and advanced to second on a passed ball. Zach Vincej followed with a single to right field that was misplayed by Brugman, an error that allowed Amaral to score and make it a 3-1 ballgame. Joseph received a no-decision after going four innings and allowing an unearned run on four hits while striking out six. Andres Avila (3-1) pitched two scoreless innings in relief of Joseph and picked up the win. Rodolfo Fernandez pitched a scoreless seventh and, after retiring the first two batters in the eighth, gave up a walk to Juan Perez followed by an RBI double to Harold Riggins to cut the Ports lead to 3-2. Austin House (SV, 19) was summoned from the Ports bullpen and after walking Sebastian Elizalde, got pinch-hitter Sammy Diaz to ground out to first to end the inning. House gave up a two-out double in the ninth to Jeff Gelalich, but struck out Sean Buckley with the possible-tying run at second to end the ballgame and notch his 19th save of the season. Layne Somsen pitched three scoreless innings in relief for the Blaze. The Ports and Blaze play the middle game of their three-game set on Wednesday at Banner Island Ballpark. Tim Alderson (4-0, 4.39 ERA) makes the start for Stockton, opposed by Bakersfield right-hander Daniel Wright (10-4, 3.95 ERA). First pitch is set for 7:05 p.m. PDT.